Fenestration components made with LVB and other EBPs are now on the market designed for efficient integration into glazing systems and engineered bamboo structures. The components are specifically designed for insulated glazing units (IGUs), window, and door thermal performance as well as strength, rigidity, and water-resistant attributes. This makes them an effective choice for sustainable design challenges. One of the benefits is that the engineered bamboo materials have tested to be more stable in climate and temperature changes than engineered woods. Engineered bamboo materials present better mechanical properties over typical natural wood materials, which means they are ideal for window and door products and assemblies. 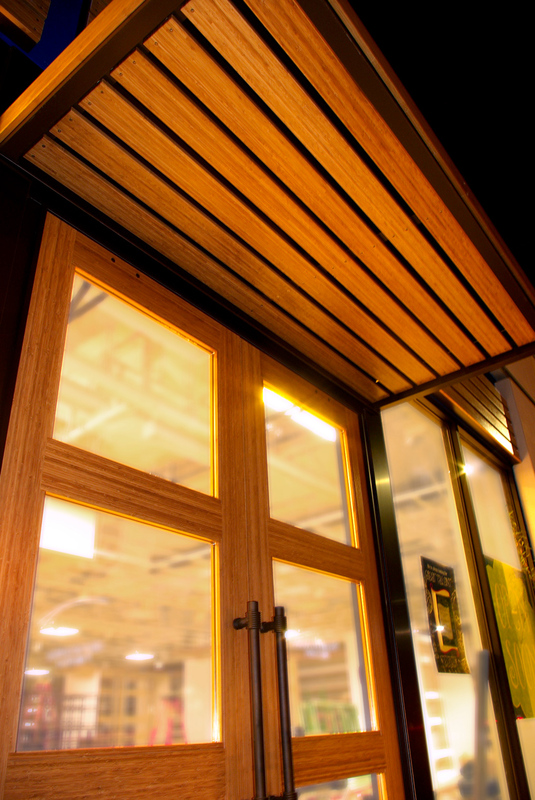 LVB functions similarly to hardwoods; however, LVB has a much better dimensional stability and as a building product can be more sustainably sourced. Some project teams and end users see LVB’s antimicrobial properties as a benefit since the resulting windows and doors resist moisture buildup. Silica content within the material acts as a natural insect deterrent as well. For high-performance facades, the windows are higher in density than hardwoods, which allows for more resilient and durable fenestration structures—which are often relative weak points in the enclosure. The density also means moderate thermal bridging as compared to softwoods, but this is offset by other performance advantages, says Schuette. For operable units, the material’s stability also allows for more uniform and smooth operation throughout the building’s use phase. In comparing density, typical softwoods used in light residential windows weigh about 36 pounds per cubic foot. LVB is much denser with a density of about 44 pounds per cubic foot, making LVB a more dimensionally stable and efficient material over typical softwoods. Since window and door applications are more susceptible to the changes in temperature and moisture, it is key to integrate a material that can withstand extreme changes in both temperature and moisture. LVB materials and components, whether standard dimensional or custom, can be used for commercial entries, operable windows, movable wall systems, lift and slide systems, garage doors/openings, and skylights, as well as storefront and curtain wall assemblies. The product can be milled with the same tools as hardwoods, making production easier for fabricators and manufacturers of fenestration products. In today's market, full system and installation services for products integrated as thermally high-performance hybrids of aluminum/LVB, a solution offered by a number of manufactures, installers, and glaziers internationally. LVB materials and components, whether modular or custom, can be used for commercial entries, operable windows, movable wall systems, lift and slide systems, garage doors/openings, and skylights, as well as storefront and curtain wall assemblies. One of the key trends in enclosure design has been the adoption of performance standards in the U.S. Green Building Council’s LEED certifications and even more so with the super-efficient Passive House standards. These programs require architects and their teams to demonstrate a specific level of energy efficiency in order to be certified. According to the Passive House Institute US, the standards and passive design in general are defined based on five building science principles: continuous insulation throughout the entire envelope without thermal bridging, an airtight envelope, heat-recovery and moisture-recovery ventilation, controlled solar gain, and high-performance windows and doors. The windows are frequently triple-paned and may include a fill, such as argon. High-performance window and doors of this type using LVB have been used successfully in Certified Passive House structures. Among the recent advances in window design is a LVB European-designed window with hardware that revolves the window 180 degrees for cleaning and maintenance without encroaching into the building interior spaces. Another is a storefront system offered with various window hardware types as well as folding, sliding, entry, and lift-and-slide doors. The manufacturers have adopted engineered bamboo because of its mechanical properties and natural aesthetics. Some manufacturers have also introduced operable and motorized fenestration systems in the last three to five years. The operable inserts can be placed in any part of the enclosure layout and include inswing and outswing venting lights in both manually operated and fully automatic motorized systems.